Are you looking to stamp your own style on a rented flat? Are you obsessed with vintage and looking for creative ways to display collectables? Or maybe you're in search of storage ideas for a period home? If you are then take a tour of Maria Toft's apartment in Copenhagen, which is brimming with inspirational ideas. See more real home transformations on our dedicated page, and find out how to renovate a house in our detailed guide. Who lives here? Maria Toft, designer of her own brand Etc Etc and owner of interior store Boho Habits in Copenhagen. Property A two-bedroom flat in the Frederiksberg district of Copenhagen, built in 1909. What she did Redecorated throughout and filled the space with a mix of vintage French finds and treasures gathered on her holidays around the world. Step inside Maria’s luxury flat in Copenhagen, and you might initially feel a bit overwhelmed. Not just because of the grand scale of the place, but because the interiors are an explosion of artefacts and curiosities that Maria has collected for most of her life. The colourful results are a wonderful mix of French vintage, modern art, hunting trophies, African masks and antique Moroccan rugs. The large sitting room is decorated with the same basic elements from French markets, but here there is a significantly warmer and organic feeling. 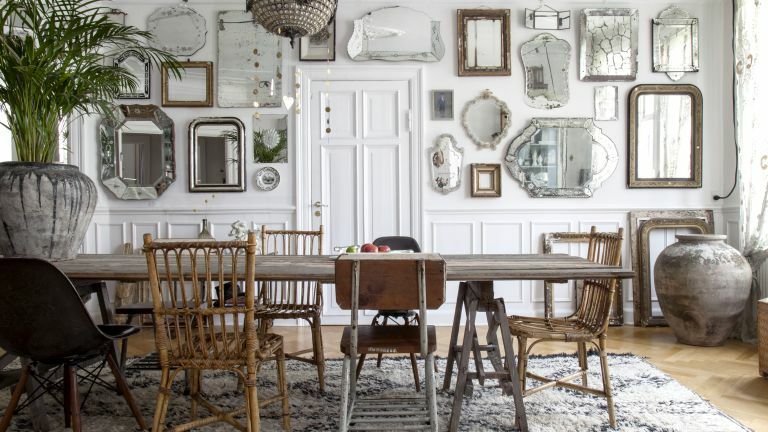 Maria’s penchant for all things French is evident at every turn, and here in her Copenhagen flat she has created the perfect illusion of early 20th-century Paris, a look that originates in the French capital’s Montmartre and Marais side streets. She loves searching for treasures in French flea markets; in fact, her passion for antiques inspired her to open her own French vintage store in Copenhagen. Maria likes things to look interesting, comfortable and relaxed, but has no set criteria for the things she buys for her home or her shop. She simply picks objects that give her pleasure, and that includes the larger items of furniture as well as the smallest decorative details. With such a diverse collection of treasures, things might easily feel cluttered, but Maria keeps things light by playing with layers of contrasting textures in neutral shades and opting for translucent lace panels, shimmering mirrors, and sparkling glass and crystal accessories. Maria thinks this beautiful old Frederiksberg apartment complements her bohemian interior style perfectly. The tall panels, large rooms, beautiful mouldings and classic parquet floors epitomise the vintage style of early 1900s Parisian salons, which are her inspiration. Having worked in Danish fashion her entire adult life, Maria now works as an agent for a number of French brands that she discovered and introduced to the Danish market. At times her flat has doubled as her showroom and many of her fashion clients have fallen in love with the quirky interiors, and asked her to source things for them, while many of her friends said she should open an interiors shop. is fully stocked with beautiful, unique finds.